The year 2019 marks the 350th anniversary of Rembrandt’s death. A good reason to honour his work and his influence on international painting. Large-scale exhibitions are planned throughout the year, and each one tells its own exciting chapter from the life story of this legendary Golden Age painter. An overview. The book Canon van Nederland. Onze geschiedenis in 50 thema’s (The Dutch Canon. Our History in 50 Themes) includes only two artists: Rembrandt van Rijn and Vincent van Gogh. While the French can also lay some claim to Van Gogh, Rembrandt (1606-1669) never set foot outside the Netherlands in his lifetime. Consequently, he has for centuries been as inextricably bound up with Dutch art and culture as clogs, tulips and syrup waffles. Commemorations of his birth and death succeed each in an ever-increasing tempo. In the past interest in Rembrandt was still quite modest. In 1956 the 350th anniversary of his birth was commemorated with two exhibitions in the Rijksmuseum in Amsterdam and the Museum Boijmans Van Beuningen in Rotterdam. On the occasion of the 400th anniversary of his birth in 2006 the Van Gogh Museum in Amsterdam organised the exhibition Rembrandt and Caravaggio. A large exhibition devoted exclusively to Rembrandt was a less obvious step at the time, because since 1991 there had been a large exhibition of his paintings, drawings and prints on show in the Rijksmuseum. In 2015 there was the impressive exhibition The Late Rembrandt; in 1999 the Mauritshuis in The Hague had devoted an equally impressive exhibition to his self-portraits. For one of the 1956 exhibitions the French De Rothschild family had loaned two striking paintings of a married couple. 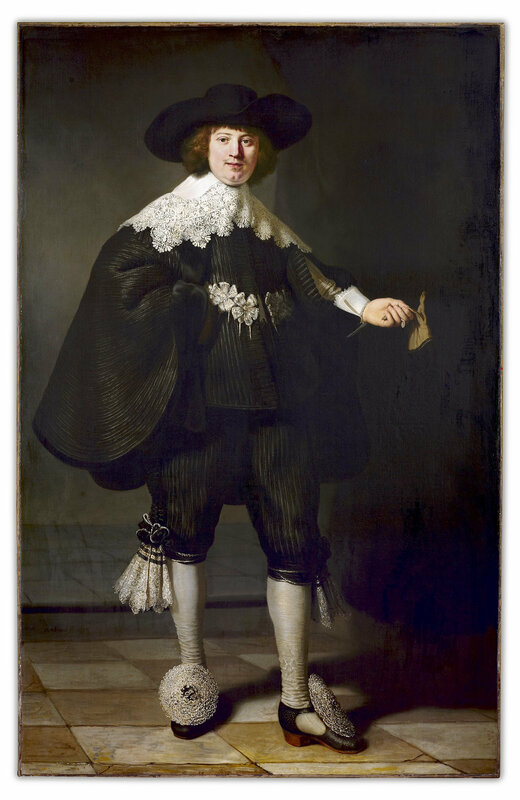 The sitters – depicted life-sized and full-length, a unique case in Rembrandt’s oeuvre – turned out to be Marten Soolmans, the son of a Flemish immigrant who had built up a fortune as a sugar manufacturer and his wife Oopjen Coppit, a scion of an old, prosperous Amsterdam family. So, this was a union of old and new money, as frequently occurred in the Dutch Golden Age. The couple were painted by Rembrandt in 1634, when Oopjen was pregnant, a year after their marriage. At the end of 2016 the two portraits were acquired jointly by the French and Dutch states for 160 million euros. It was agreed that the two portraits would hang alternately in the Rijksmuseum and the Louvre, always together and never separated. Acquisitions or auctions of Rembrandt paintings were always big news, but with that purchase (especially the huge amount that was paid for the canvases) the artist had definitely become world news. And while earlier exhibitions were intended primarily for art experts and connoisseurs, Rembrandt has today become completely democratised. 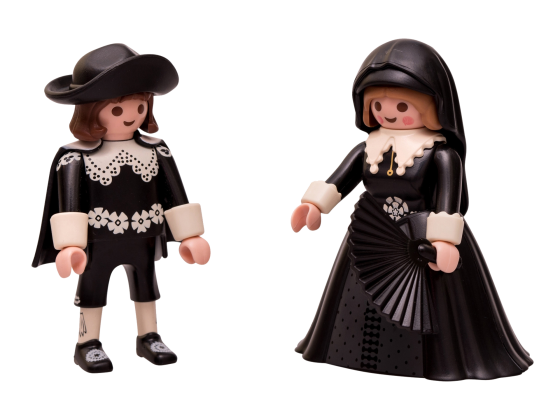 That is made clear by the fact that Marten and Oopjen are on sale as plastic playmobil dolls, an honour they share with the main characters of Rembrandt’s Night Watch and Johannes Vermeer’s Milkmaid. Rembrandt van Rijn, Saskia in precious costume, 1642-1643 © Gemäldegalerie Alte Meister, Kassel. It is therefore no cause for surprise that the year 2019, 350 years after his death, should have become a theme year in which Rembrandt will be commemorated, illuminated and explained on a grand scale and in all kinds of ways. That will happen in various locations in the Netherlands, with each museum or institution focusing attention on the painter in its own way. 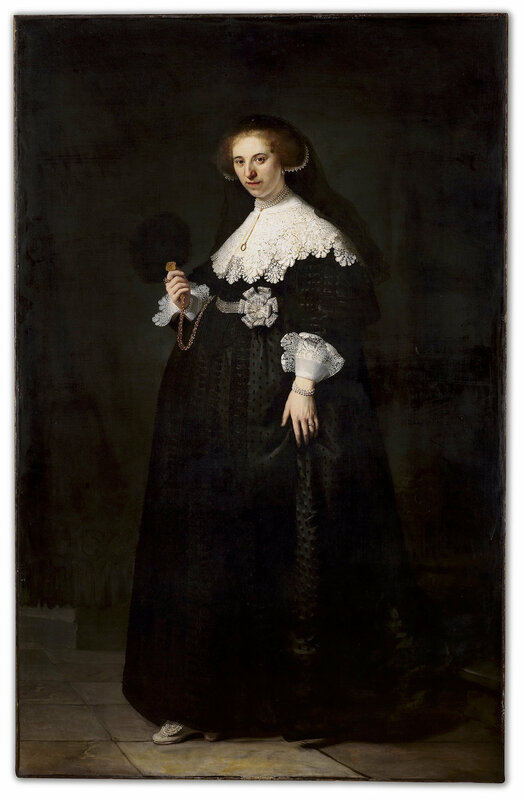 The process was kicked off by the Fries Museum in Leeuwarden, the birthplace of Rembrandt’s wife Saskia van Uylenburgh. In the exhibition Love in the Golden Age, which runs until 17 March 2019, Rembrandt’s portrait of Saskia from Kassel is of central importance. This painting, in 2000 declared to be the favourite painting of the inhabitants of Kassel, had never been on loan before. Saskia and Rembrandt married in 1634. Eight years later she died, aged 29. 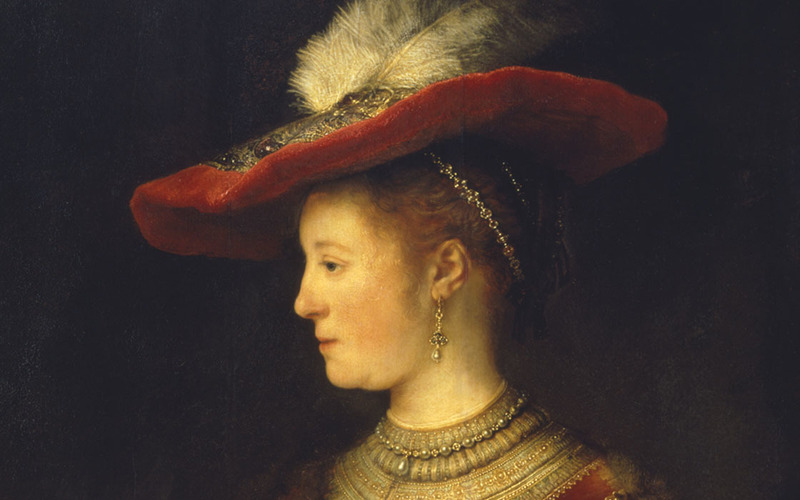 Rembrandt completed this portrait shortly after her death. Of their four children only Titus survived. In the exhibition in the Fries Museum all kinds of objects are on display which played a part in the 17th-century ritual of courtship and betrothal. In the Amsterdam Municipal Archive until 7 April under the title the Private World of Rembrandt, original archive documents will be on display connected with Rembrandt’s family, work, customers and creditors. 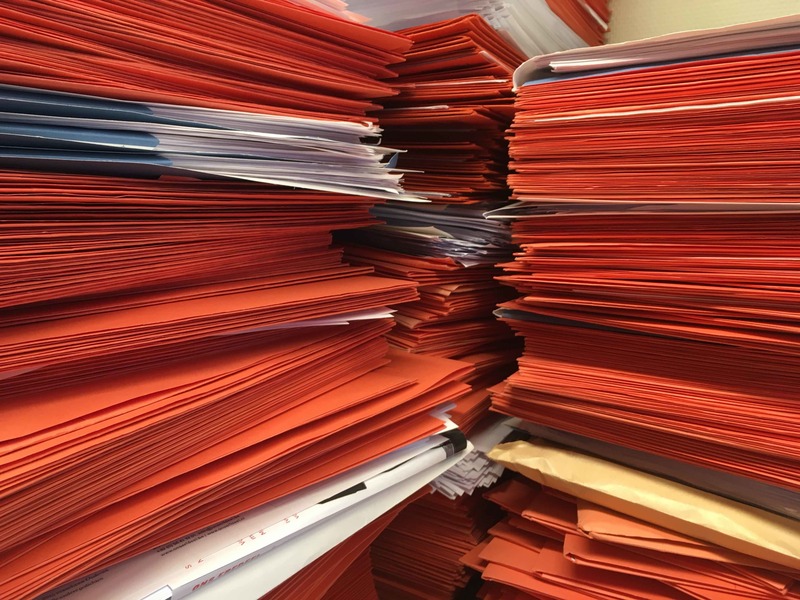 Those documents are made accessible through modern technology with the help of images and sound. Until 10 June the Rijksmuseum will be showing all the works by Rembrandt in its own collection. That amounts to 22 paintings, 60 drawings and 300 prints. And from July onwards the Night Watch will be restored in situ, watched by the public, which can follow the process from behind a glass wall. Teylers Museum in Haarlem will show Rembrandt’s complete etchings in the summer of 2019. In Museum Het Rembrandthuis in Amsterdam the exhibition Rembrandt’s Social Network focuses until 19 May 2020 on the painter’s friends and acquaintances, including his Leiden childhood friend the painter Jan Lievens, the art connoisseur and Amsterdam mayor Jan Six and the apothecary Abraham Francen, who stood by Rembrandt in his difficult final years. In addition, until 16 Februari 2020 new insights will be presented into Rembrandt’s painting technique. Leiden, the painter’s home town, will focus on the young painter. Until 9 February 2020 in the completely refurbished Museum De Lakenhal over forty paintings, 120 etchings and twenty drawings will show the enormous development the painter went through in the first ten years of his career. 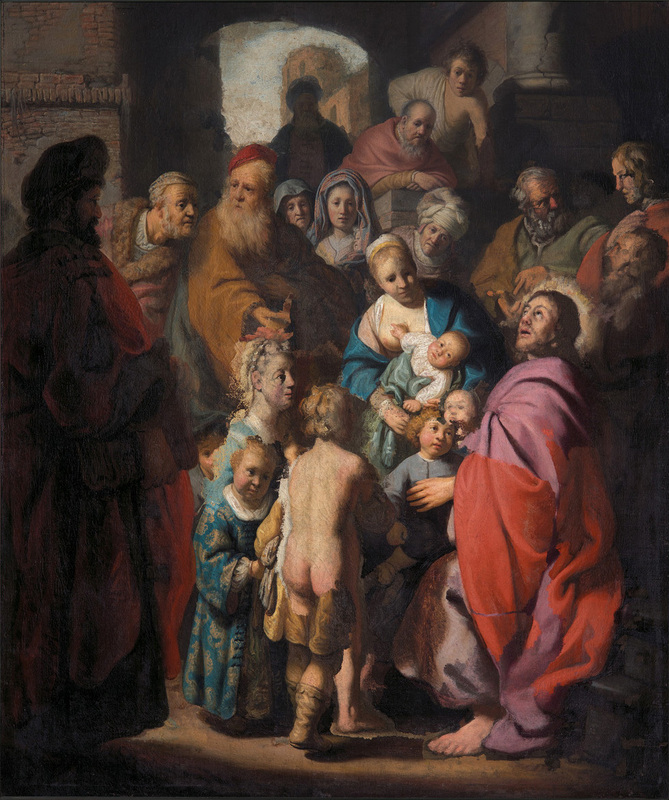 Also on show will be the recently restored painting Suffer the Little Children to Come unto Me, a work that art dealer Jan Six discovered at an auction in Cologne as ‘a new and undiscovered Rembrandt’. And in case someone would prefer to visit a Rembrandt exhibition abroad, the painter is also being celebrated in the United States, Canada, the United Kingdom, Germany and Abu Dhabi. 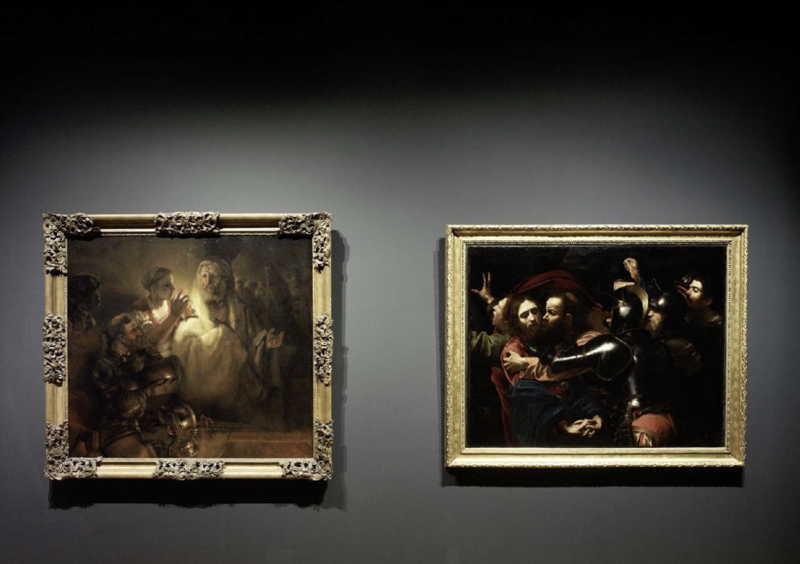 In February, for example, in the new Louvre Museum in Abu Dhabi, the exhibition Rembrandt and the Dutch Golden Ageopens. The Paris Louvre loaned a large portion of its own Rembrandts for the purpose. But for stay-at-homes too there is enough Rembrandt news to keep up with from one’s armchair. In November an article appeared in the Leiden Yearbook by the mathematician Johan Zwakenberg, establishing the identity of two portraits of an unknown married couple in the National Gallery of Art in Washington. The man turns out to be Frans van Schooten, a well-known Leiden professor of mathematics. In 1652 he married Magrieta Wijnants. 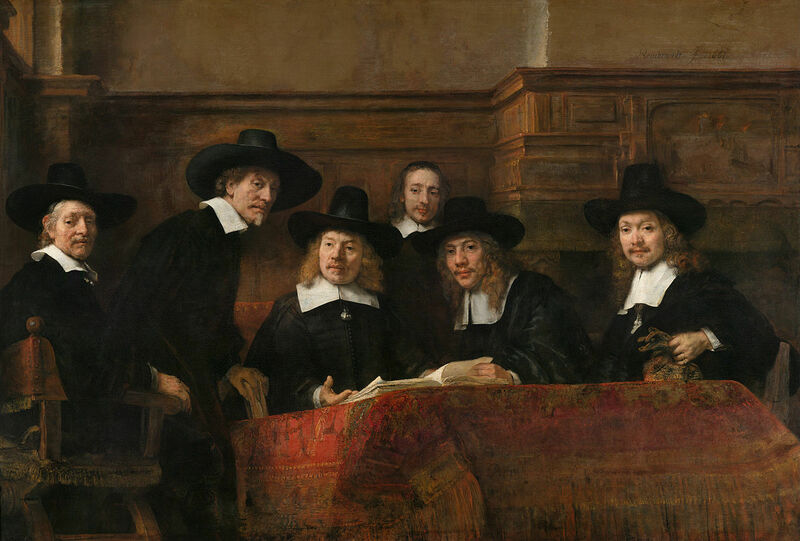 The portraits were probably ordered from Rembrandt on the occasion of their marriage. In other words, Rembrandt research is still going strong.